When I was a kid (probably 6 or 7), there was a big controversy in our community whether the water would be fluoridated or not. Now, I was just becoming fascinated by science, medicine, health, and sports at that time, so I tried to figure out what was happening. To my ears and adolescent brain, the argument boiled down to no fluoridation (which meant cavities and visits to the dentist) vs. fluoridation (which was a communist conspiracy). Scary choices. Though Nazi dentists were also plenty scary. But I grew up, and fluoridation became more common, as communities accepted the evidence that fluoridate water was safe, and improved the health of the community’s teeth. Water systems are mostly fluoridated (unless you drink bottled water). And fluoride is in toothpaste and various mouthwashes. I thought the fluoridation controversy had passed into history with rotary phones, the Soviet Union, and the slide rule. My younger readers probably have never seen any of those three in their native states. Vitamin D supplements–improves bone health or a waste of money? 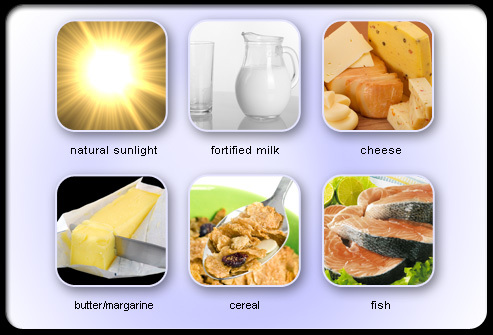 Natural sources of vitamin D.
Lots of people take vitamin D supplements to keep their bones strong as they age, advice that is pushed by legitimate organizations, like the National Osteoporosis Foundation. But does vitamin D actually do anything, or are their effects some kind of myth? A group of researchers in New Zealand examined previous clinical trials involving vitamin D supplements to determine if they actually helped improved bone density, a critical measure of bone strength and health. Their meta-review of the data was recently published in the Lancet. The researchers determined that vitamin D supplements did not usually increase bone density for people who already had normal levels of vitamin D. Although bone density did improve in the femur, the longest and heaviest bone in the human skeleton, all other bones did not exhibit a higher density after vitamin D.
The systematic review included 23 previously published studies (comprising a total of 4082 participants, 92% women, average age 59 years) who received vitamin D supplementation over an average of 23.5 months. Bone mineral density was measured at one to five sites (lumbar vertebrae, femoral neck, total hip, trochanter, total body, or forearm) in each study. The studies included in the review had differing vitamin D supplementation regimens. The vitamin D dosages, as well as the length of the treatment, varied across. On average, 500 IU (international unit, with each unit being the biological equivalent of 0.025 μg cholecalciferol/ergocalciferol) was the daily dose in six of the studies, 500-799 IU was used in four studies, and 800 IU or more was used in 13 studies. Across all of the studies, 70 tests of statistical significance were performed. Of the 70, six had findings of significant benefit of vitamin D supplementation, two showed significant detriment, and the rest, 62, show no significant benefit or detriment. Of all the studies, only one showed a benefit at more than one bone site. And more supplementation did not show any benefit, so there was not a dose-reponse effect. Most importantly, of the studies that did report improvement in bone density, the finding was not significant enough to prevent a bone from fracturing after a fall. Surprisingly, the researchers also discovered that doses of less than 800 IU per day were more effective for improving bone density in the spine. The researchers concluded that “continuing widespread use of vitamin D for osteoporosis prevention in community-dwelling adults without specific risk factors for vitamin D deficiency seems to be inappropriate.” In other words, the evidence does not support the hypothesis taking vitamin D provided a benefit of increased bone density in individuals who already had healthy levels of vitamin D–supplementing with vitamin D was not necessary for most adults over the age of 55. Moreover, the researchers recommended that healthcare providers should target individuals who may not be getting sufficient vitamin D naturally, such as through exposure to sunlight, with either vitamin D supplementation or sunlight therapy. To answer the original question? Yes, vitamin D supplementation is a waste of money, unless there specific issues that would indicate that it would be useful, such as in individuals who do not make sufficient vitamin D naturally. And no, more vitamin D does not help. Reid IR, Bolland MJ, Grey A. Effects of vitamin D supplements on bone mineral density: a systematic review and meta-analysis. Lancet. 2013 Oct 10. doi:pii: S0140-6736(13)61647-5. 10.1016/S0140-6736(13)61647-5. [Epub ahead of print] PubMed PMID: 24119980.